Katherine has been playing a game called Vigoro almost every weekend since we arrived in Australia. The game is held every Saturday, usually starting about noon or 1 pm but it can start later if other teams or grades are playing. Vigoro is a game similar to Cricket. If you are not familiar with Cricket, well, neither am I. Actually, I am familiar, but I still don't understand the game (why you would play it, why it is fun, how the score works, etc). The most interesting thing about vigoro is that is a solely a women's game, and the competing teams are made up of all ages. Literally, a grandmother may play on a team with her granddaughters. 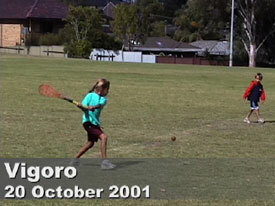 The title frame of the movie, featuring an attempt to hit the ball with the bat. 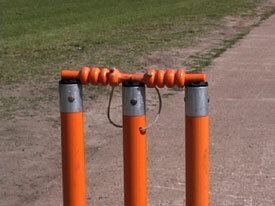 A close-up shot of a vigoro wicket. 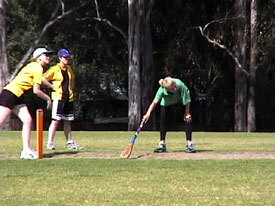 The idea is that is the bowler (pitcher) hits the wicket while you are batting, you are out. And if you are running between the wickets, trying to score runs after the ball was hit, the fields will try to tag you out by hitting the wicket and knocking off the little pegs. 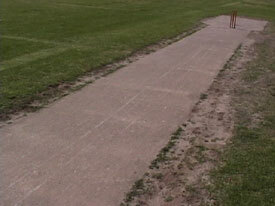 A view of the vigoro pitch, where the ball is bowled to the batter. The pitch is basically an asphalt strip that widens on each side. 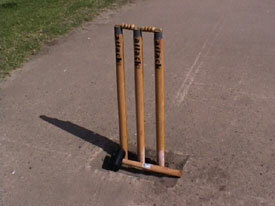 Another view of a vigoro wicket, complete with the mallet used to set the pegs after the wicket is hit. The end of a vigoro bat can appear pretty scruffed up, thanks the fact that it is constantly banged against concrete and dragged against the ground. In an effort to get the bats to last longer, leather is strapped over the end and secured with metal fasteners. If the whole setup looks medieval, then you get the idea. 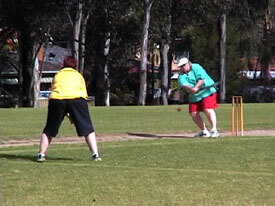 The blur by her knee is the hard vigoro ball streaking by on its way to the wicket. 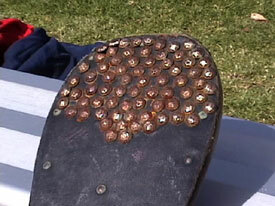 The ball is very hard, and none of the players wear any pads, except for the catcher behind this wicket. Unlike baseball, where the batter is given a little room to hit the ball, opposing vigoro players stand quite close, ready for any tipped balls. 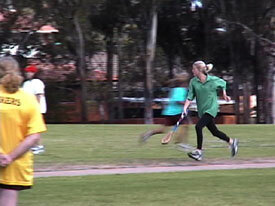 This shot show Kath running after a hit, with another Rozella player streaking by beside her. 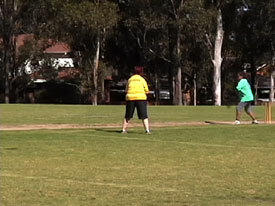 Both players take turns trading places at the wickets, scoring a run for each exchange, until the ball is thrown back into play and they stop or someone is thrown out. The vigoro bowler throws the ball from behind the opposing wicket, right past the batting team's player that is not actually batting. 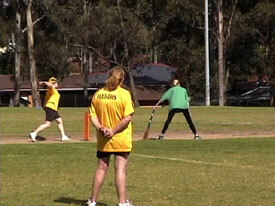 Kath usually remembers to stand well clear of the ball while it is bowled. After a good run, Kath is finally tagged out. She takes it well, though.